I am really worried working in Windows 7 PC because whenever I open some application it simply asks for granting permission for the application to run. Once it will be ok but everytime asking for the permission when we try to open that particular application is quite annoying. How to disable this type User Account Control system in Windows 7? Is it possible to do it? How can I do it? 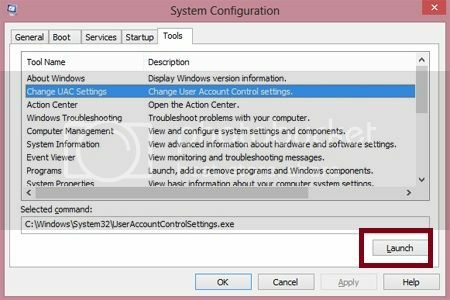 Re: How to disable the User Account Control system in Windows 7 PC? Is it possible to do it? STEP 1: Open Start from the taskbar -> type User Account Control in the search text box. 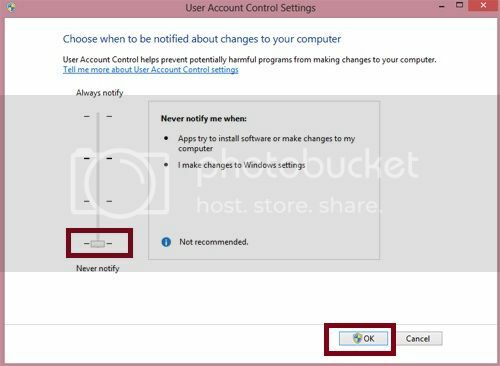 STEP 2: Select the option “Change User Account Control Settings” -> You will get the windows with the slide bar saying Always Notify and Never Notify. STEP 3: Now bring down the slide to the Never Notify position and Click Ok.
Now you can see that there is no popup windows bugging you every time to open applications or so but always keep in mind that User Account Control option was introduced only because of the virus and malware threats getting increased day by day so think twice before you disable the UAC option because once you disable it you are leaving your Windows PC at your own risk. There are two methods to disable uac in windows 7. 4. Set the value of EnableLUA to 0. 2. Set the value of ConsentPromptBehaviorAdmin to 0 (optional)Now Exit from Registry Editor and Restart the computer." 4.Now there is a slider make it to never notify or at the minimal level. Now you will not be prompted every time you open an application. 1.Click "Start","Control Panel","User Accounts and Family Safety","User Accounts","Change User Account Control Setting".You can also click the "Start Orb" and type "Change" in the instant search field. "Change User Account Control Settings" appears in the list for you to select. 2.Drag the Slider up or down to choose the level of UAC notification.You have four levels of protection.The default level is to only be notified when changes are made to Windows settings. 3.Drag the slider to the bottom to never be notified of changes to programs or windows settings.This setting disables UAC. 4.Drag the slider to the top to always be notified of changes to programs and windows settings. 5.Drag the slider to level 2 to only be notified when changes are made to your programs.. User Account Control (UAC) is a technology and security infrastructure. In this only those softwares which are trusted by user receive administrative privileges and malware and other suspected items get blocked. It is an important security measure but some of us dont like it much. 1.Click on start menu followed by control panel. 2.In the control panel window click on User Accounts and Family Safety.Next click User Account to access the user account and related options. 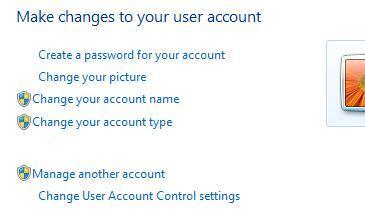 3.Now in the window that appears click on change user account control settings. 4.Slide the slider bar to the lowest value (towards Never Notify), with description showing Never notify me. 5.Click OK to save the changes. 6.Restart the computer. This will turn off User Account Control system. A dialog box appears bring the slider to the lowest level i.e never notify option. Go to Start->Control Panel->System and Security->User Account. Now type "MsConfig" in start search option to start system configuration. Now go to Tools tab and select change UAC settings. Restart the computer for proper changes. 1.Go to START>CONTROL PANEL>USER ACCOUNTS AND FAMILY SAFETY>USER ACCOUNT. 2.Go to START>CONTROL PANEL>SYSTEM AND SECURITY>ACTION CENTER. 3.Click or right click on Flag icon in notification area and then Open Action Center. 4.Type “MsConfig” in Start Search to start System Configuration, then go to Tools tab, select Change UAC Settings, then click on Launch button. 5.Click on User Account Control settings link. 6.Click OK to make the change effective. 7.Restart the computer to turn off User Access Control.